Pastor Lorelei began her appointment to the Willow Grove UMC in July 2015. As the daughter and granddaughter of UMC ministers, she loves the way in which the church community works together with the gift of the Holy Spirit to bring healing, wholeness, and abundant life to fruition in small community. She also has seen first hand the challenges that the church of the 21st century faces. "For many that have not had the unique experience that I had growing up in the church in the way that I did, church may seem irrelevant, hypocritical, or just plain foreign... I hear that and get it. Yet, I continue to work to see the church live into the full potential and vision which Jesus casts for us of the Beloved Community, which embraces persons of all ages, races, nations, and abilities." Rev. Toombs was raised in the greater Philadelphia area, and is a graduate of both J.R. Masterman High School and Temple University's School of Social Administration (BSW). As a trained violinist, she played for years with the Philadelphia Youth Orchestra, eventually leading her to meet her husband abroad, in England. She continued her education, receiving a Master of Divinity at Duke Divinity School in Durham, NC, and was fortunate on several occasions to study and work abroad, including significant time in London, England and Durban, South Africa. Previous pastoral appointments have included seven years in Northeast PA's coal region and the wonderful small town of Conyngham, and four years in inner-city Philadelphia, in Germantown. Now, the mother of two school age children, two beagles (and a few fish! ), she is excited about what the future for her and the Willow Grove community will hold. 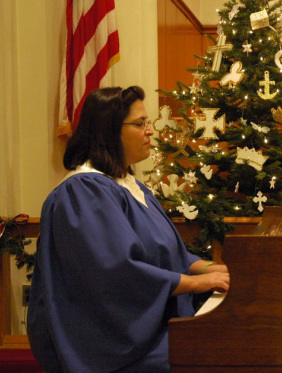 Kathleen Harrod has been the organist/pianist for the Willow Grove United Methodist Church for over seventeen years. She provides organ and piano music for all services and programs, and, as a gifted accompanist, she plays for all of our choirs and soloists. In addition, Kathy has performed as accompanist to local choirs/ soloists, including PhiloMusica Chorale and the Franklinville Quartet Club, and she has participated in educational programs for Musicopia of Philadelphia, with violinist, Diane Monroe. Kathy has studied organ with David Daugherty and Sharon Bertha McCabe. A multi-faceted musician, she holds a B. Mus. in piano performance, and B.M.Ed. from Ohio State, an MM in clarinet performance from Temple University, where she also did doctoral study with the late, great Anthony Gigliotti. As clarinetist, Kathy held the principal chair with the Delaware Valley Philharmonic in Bucks County for over thirty years. In addition, Kathy taught instrumental music in the Council Rock and Neshaminy school districts and at Germantown Academy for a total of fifteen years. Like many musicians, Kathy has a “day job”, which she loves as much as performing—piano tuning. Chances are good that she tunes pianos in your neighborhood, as she covers at least four counties in the region. When she is not on the organ or piano bench, Kathy is also helping in the church’s food ministry. Kathy Harrod is a native of Harrod, Ohio, population 600, and as quiet as it is kept, she initiated the long-standing Harrod family tradition of pie-fighting. Wendy began her employment with Willow Grove United Methodist Church on August 29, 2017. Her background includes over 25 years in Human Resources in the banking and healthcare industries. She was born and raised in Philadelphia and now resides with her family in Maple Glen. 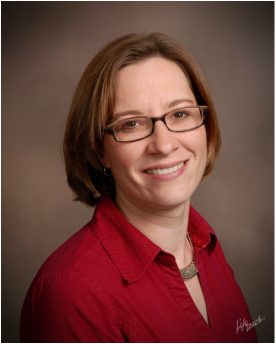 Wendy is a graduate of Olney High School and attended Penn State and LaSalle University. She is a member of Jarrettown United Methodist Church.